EASY’S BRIDGE [SP104] – Attenzionen!!! 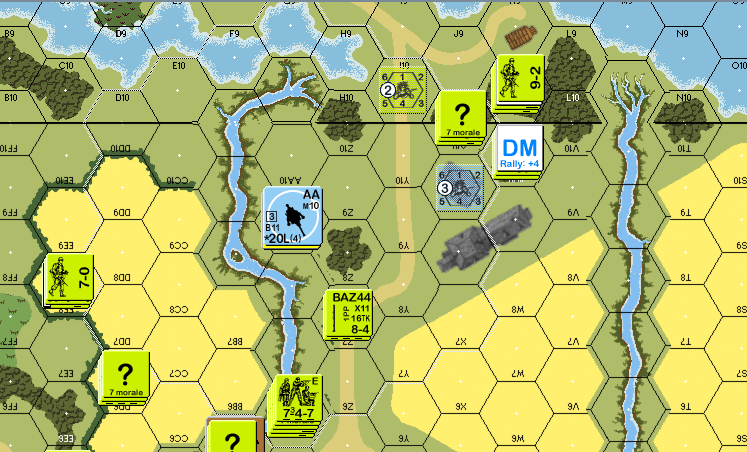 As the American player I planned to neutralize the German reinforcement expected to enter from the South and then advance towards the bridge. First I was fearful of the FlaK turrets, but later I discovered that they can be neutralized quite easily. The main problem I am fighting – as ever – is the time schedule. North of the Maas river elements of F Company 504 PIR have entered the area in turn 5. They slowly and systematically close FlaK tower and bridge. 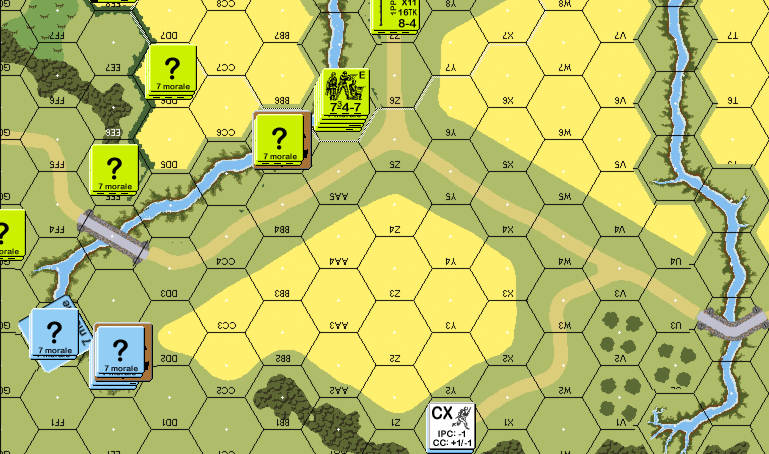 Here we find the main concentration of German troops who have pulled back over the river since turn 1 and dug in. A lucky shot from the MMG on the southern river bank hit for a 2MC and broke the FlaK crew. 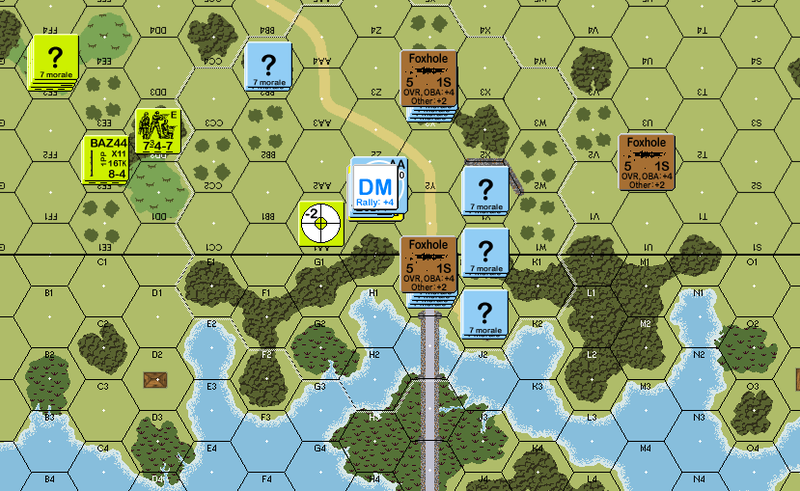 On the south side of the river the main American force is preparing ints attack across the bridge. Unfortunately sniper fire has broken one of the squad. The FlaK tower is neutralized from turn 3 by accurate rifle and MMG fire. The 60mm mortar is slowly advancing and now has ranged in on the FlaK tower and is to kill the crew. In the southern area the German reinforcements have attempted to gain the bridge. After being attacked on arrival by the paratroopers they occupy some defensible terrain. The American reinforcements hit this force in the flank and killed the leader and a squad. 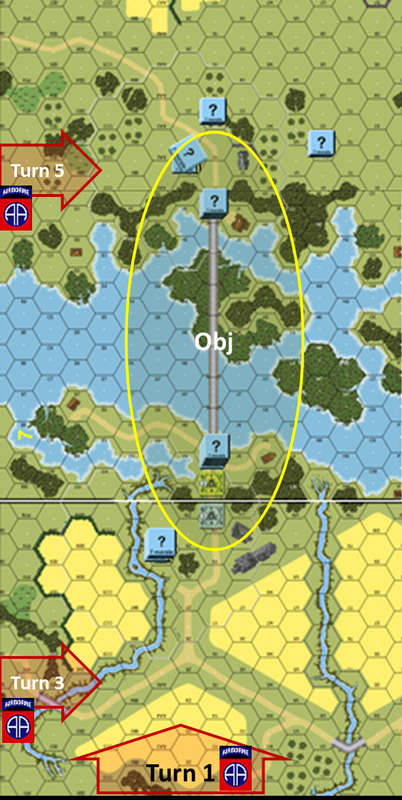 The Germans try to recover and to take up positions that will prohibit routing off the bridge. The Americans are comparatively week on the north side of the river. Thus E Company will need to cross the bridge with some of its squads. This may well prove hazardous. Also environmental conditions are constantly deteriorating with heavy rain having set in. This might or might not benefit the Germans for it makes long range MMG fire less effective but also gives American units protection while moving. All together the situation is quite encouraging for the Americans. Will my troops be able to clear the bridge from enemy elements within the given time limit? Well, this we will find out in about two weeks from today.